The upper stage of a Soyuz-U booster carrying an unmanned Russian Progress supply ship malfunctioned and shut down five minutes and 20 seconds after launch Wednesday from the Baikonur Cosmodrome in Kazakhstan, NASA officials said, sending 2.9 tons of space station supplies and equipment crashing back to Earth in the first post-shuttle launch to the lab complex, officials said. It was the second failure in a row for the Russian space program after the Breeze-M upper stage of a more powerful Proton rocket malfunctioned last Thursday, stranding a communications satellite in the wrong orbit. The Breeze-M is not related to the Soyuz-U's upper stage. The Progress M-12M/44P spacecraft was loaded with 2,050 pounds of propellant, 110 pounds of oxygen, 926 pounds of water and 2,777 pounds of U.S. and Russian dry cargo. While the supply train to the space station is critical for supporting a full-time crew of six, the lab complex currently is in good shape, flush with supplies and equipment delivered to the outpost aboard the shuttle Atlantis in July. While the manned Soyuz features an escape rocket to pull the crew capsule away from the booster in an emergency, it is jettisoned two minutes and 40 seconds after launch. A similar failure during a manned launch likely would be catastrophic. "So obviously, this has implications to the vehicle on orbit and the crew as well," said Mike Suffredini, manager of the space station program at the Johnson Space Center in Houston. "Our Russian colleagues ... will immediately begin to assess the data that's available to try to determine root cause." But given the supplies already stored on board the space station, "we're in a good position logistically to withstand this loss of supplies," Suffredini said. "And in fact, I would tell you we can go several months without a resupply vehicle if that becomes necessary." Three station crew members -- Expedition 28 commander Andrey Borisenko, Alexander Samokutyaev and Ronald Garan -- are scheduled to return to Earth Sept. 8 aboard the Soyuz TMA-21 spacecraft. They are to be replaced by Anton Shkaplerov, Anatoly Ivanishin and NASA flight engineer Dan Burbank, scheduled for launch Sept. 22 aboard the Soyuz TMA-22 spacecraft. It is not yet known what impact the Progress failure might have on that launch, but Suffredini said the departing crew can extend its stay if necessary to continue normal science operations while the Russians work to resolve the Progress anomaly. "This particular crew, they're nominal return on the eighth of September resulted in a (156)-day period on orbit," he said. "We nominally plan for 180 days and in fact, we have about a 30-day contingency on that. So we have at least 40 to 50 days of contingency for the crew to stay on orbit that much longer to allow us to stay at six crew while they sort out the anomaly." In a worst-case scenario, he said, the station could make it to March without any additional cargo. But Borisenko's crew would have to head home sometime in October, if the upper stage problem is not resolved by then, leaving the station with a crew of three until replacements could be launched. While that would reduce the amount of research that could be conducted, the station would be in no immediate danger. "At some point, the vehicle on orbit that has Ron and Andrey and Sasha will time out and so we will have to bring them home," Suffredini said. "But operating at a three-crew size is something we're familiar with and able to do, although it would have implications in our ability to perform research." Soyuz crew ferry craft are certified for between 200 and 210 days in orbit. Borisenko, Samokutyaev and Garan blasted off April 4 U.S. time, so they have nearly eight weeks of margin beyond the planned Sept. 8 landing target. If their stay is extended because of the Progress investigation, their station crewmates -- Mike Fossum, Sergei Volkov and Satoshi Furukawa -- could delay their return to Earth about six weeks past the current Nov. 16 target. Given the safety record of the Soyuz-U rocket -- 745 successful launches and just 21 failures over nearly four decades -- NASA managers are optimistic the Russians will resolve the problem before it would be necessary to reduce the station's crew size. 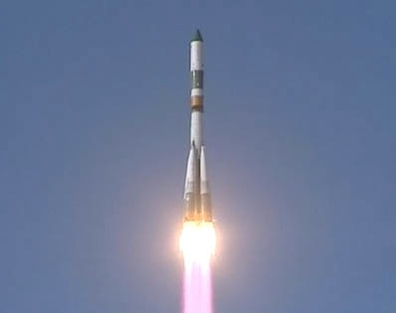 The Progress mission began with an on-time liftoff at 9:00:11 a.m. EDT (GMT-4). The initial phases of flight appeared normal as the Soyuz-U rocket climbed away from its firing stand under a cloudless blue sky. But during the third stage"burn," something went wrong and "the vehicle itself commanded an engine shutdown due to an engine anomaly," Suffredini said. The spacecraft was not going fast enough to reach orbit and U.S. tracking systems never saw the Progress climb above the horizon. Suffredini said the Progress crashed to Earth in the Altai Republic of the Russian Federation, which shares borders with Mongolia and China. Maxim Matuchen, director of the Russian mission control center, radioed the news to the station's crew. "Following 320 seconds of flight there was a failure in the upper stage of the launch vehicle," he said. "We lost comm after a while with the launch vehicle and the vehicle itself. And we did not report stage separation. In the previous comm pass, we attempted to contact the vehicle through every possible channel, commands, orbital monitoring, telemetry, and we have just finished our second comm pass, where we invoked all of the communications facilities. We sent commands to activate the comm (equipment) on board, unfortunately in vain." "Understood, copy," Borisenko replied from orbit. "This is it for the moment, we'll try and figure it out, what has happened, what the cause was, I just wanted to let you know and inform you, keep you in the picture." "Thank you," Borisenko said. "This is very important that you let us know so quickly. Thank you from the entire crew."